We only ride one wave at a time, so we only make one board at a time, it makes sense. That's the Daily Bread way, it's all about having enough for today and riding that wave for all its worth. 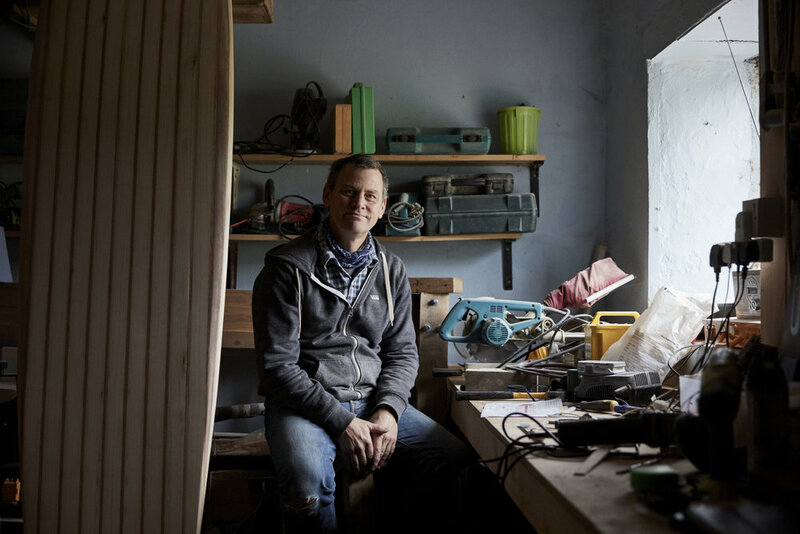 From our workshop on the Mendip Hills of South West England we love making hollow wooden surfboards, you can even come and make one with us if you'd like? Making custom boards... We start by having a conversation: we can talk, meet and exchange ideas until we are both comfortable with what it is we are trying to achieve. 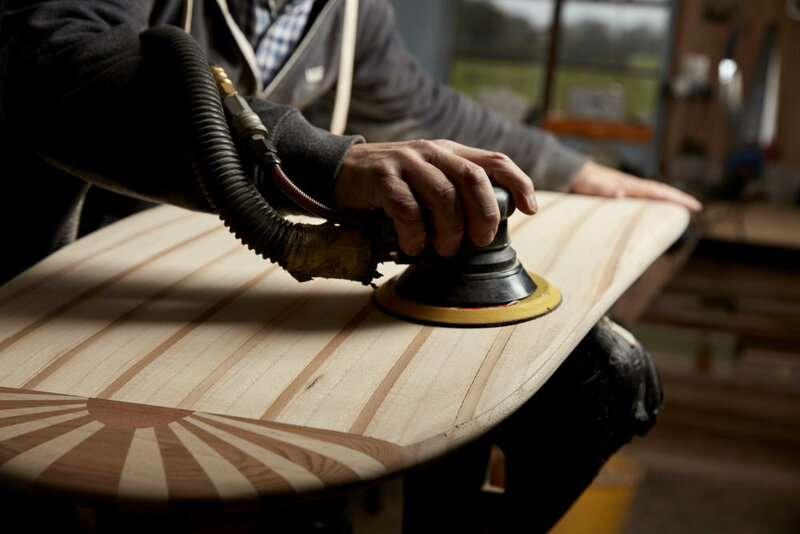 You can design almost every aspect of your board including length, shape, cedar stringers, nose and tail blocks, leash plug, fin set up and much more! No kit here... We start with a blank sheet of paper and design your board together until we are both happy. Then we choose a rough plank of Paulownia and together shape it into something beautiful. 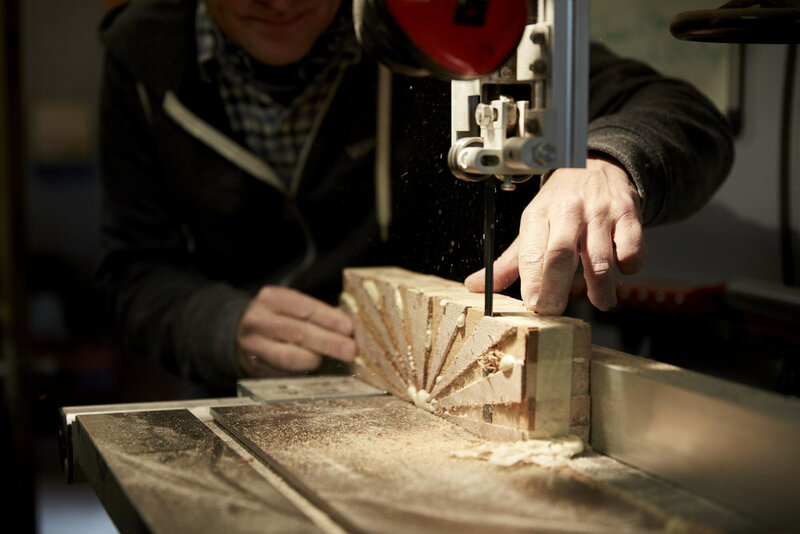 Don't worry if you have never used hand or power tools before. Attitude is more important than ability! I only work with one person at a time and with a little bit of encouragement you will be amazed at what you can produce, however if you have any concerns please ask. Click the button for a little bit more on the process. I love wooden boards. I love making them, I love riding them and I love other people riding them too. So what's the point in having a rack of boards in my workshop when they could be out there spreading the love? Hire one of my boards for £20 a DAY. Going on a surf trip? 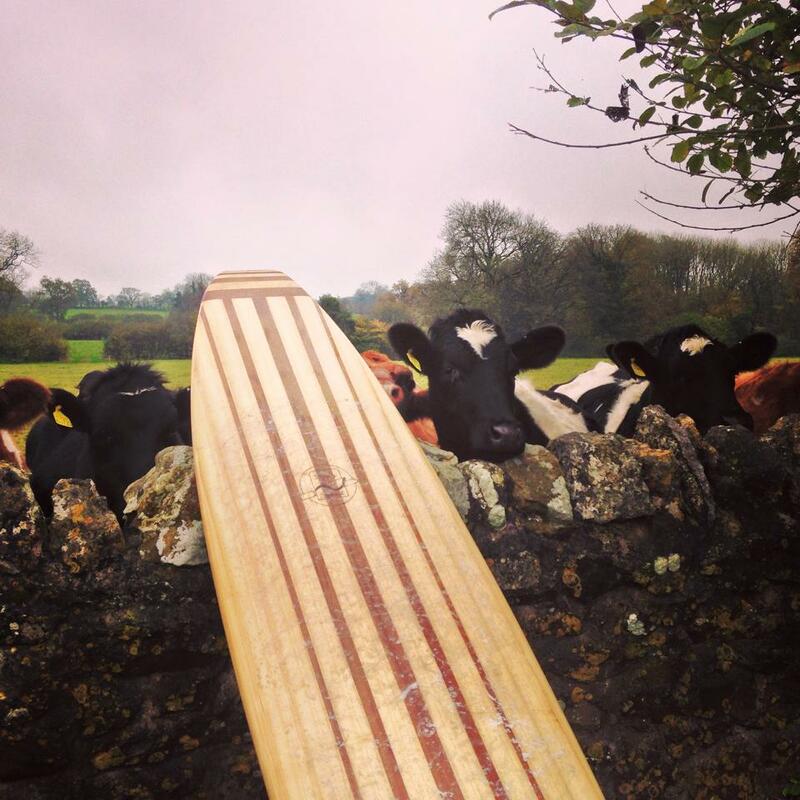 Want to take something different to surf? 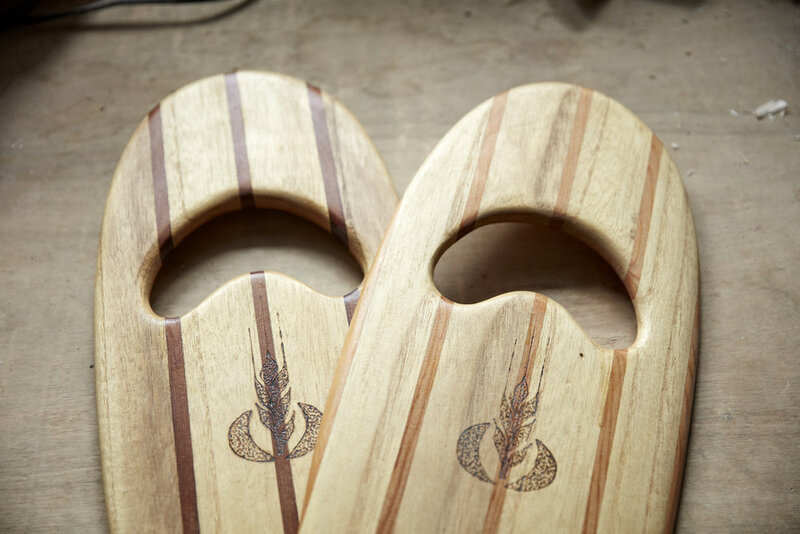 Curious to see how a wooden board rides? If you just want to experience what it's like to ride a wooden board, with no intention of buying, that's cool with me, I hope you catch some great waves! Get in touch and we can discuss where and when and what boards I have available. If you then decide that life is no longer complete without your very own Daily Bread surfboard, I'll take your most recent hire fee as a part of your initial down payment. I repair wooden boards and foam boards, this is an art in itself! 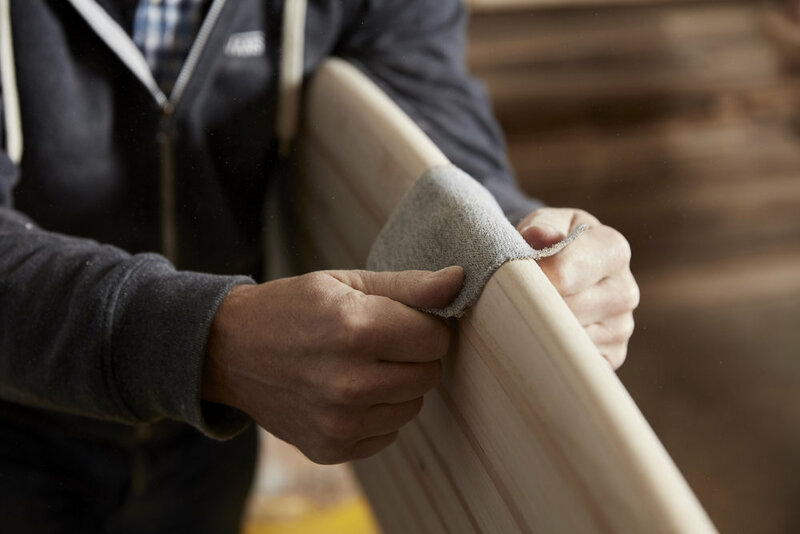 A board's dings are part of its history and strangely the repair itself can become part of the overall beauty of the board. It is difficult to generalise about the pricing of repairs but I charge £25/hour for workshop time plus materials. I would expect a rail or deck ding to take me a couple of hours of labour to fix, plus a couple of days for resin coats to cure etc. but get in touch, send me a picture and I'll be able to give you a better idea. I really don't like wasting wood so I make lots of lovely things from the offcuts. Take a look there are lots of present ideas for surfers. My wife was at a networking meeting the other day, well coffee with a friend. We like to call it networking because it sounds more business-like, also it can then go in our work planner with no guilt associated. 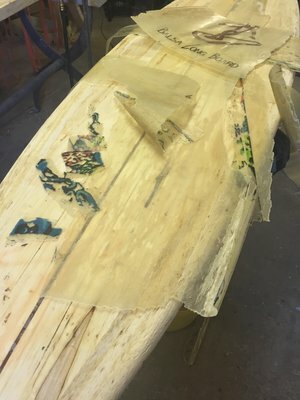 Where is the love in having a quiver of beautiful hollow wooden surfboards sitting in their rack, 800 feet above sea level and 2 hours from the nearest surf? They should be in the sea getting wet and putting smiles on faces! In part one of this story I drilled 17 holes in a favourite board of mine and filled them with paint brush handles. This was not some art installation, but rather the start of a very effective little repair dodge I've developed to reattach a deck to the internal frame. Granted this looks totally bizarre. Why would you stick paint brushes to a surfboard? Is it some kind of art installation? No, it's a repair! Idiot that I am, I forgot to undo the pressure relief screw on a hot day and dear old "Numbers" started to look more like a puffer fish than a surfboard. Walk on Water? I Wish! Dilemma, do I put up a video of me surfing my own boards? When there is so much high quality footage of people surfing, why would I want to show my lame efforts? Even though it is the only footage of me and my boards in action, will it inspire you to let me make you a board or come and make one with me? Spent an incredible four days shaping 'Joel' with Chris. 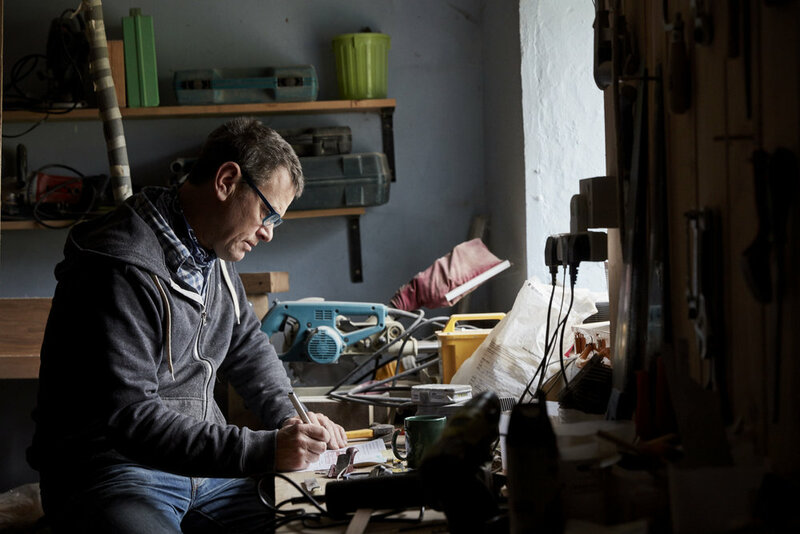 He is a true craftsman and a inspiration to work with. I now have the most incredible 8' 6" unique board. Can''t recommend the whole experience highly enough. A true masterpiece. Quality craftsmanship in every detail. Chris from Daily Bread took on the project with attention to detail and was able personalize the board so that our vision came to life. My family and I have proudly displayed the Amos 5'6" prominently as a centerpiece in our living room causing me to dream daily about the ride. "Hi Chris thanks for the message. The board is back in my hands and has been parading herself at Saunton and sometimes Croyde. You have done a great job and I am so happy to get her back so seaworthy! Surfs like a dream :) Thank you! 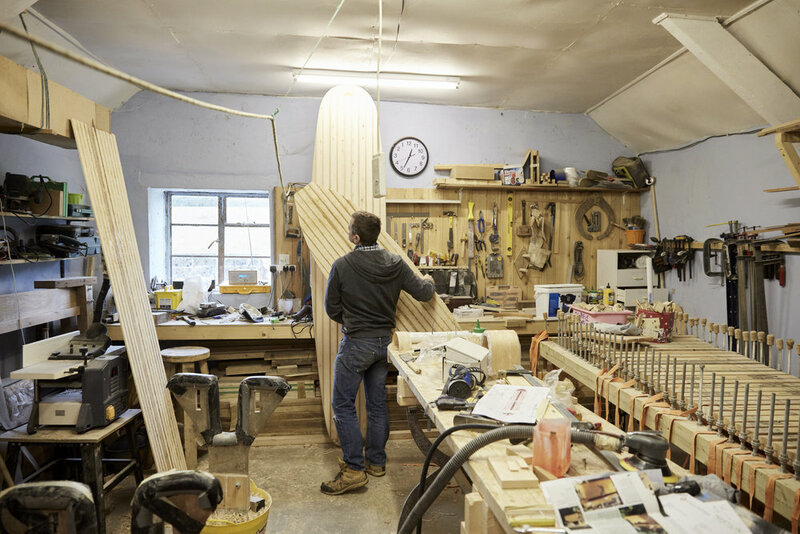 ...I emailed countless experts on wooden surfboards and no one came up with the solution you offered. 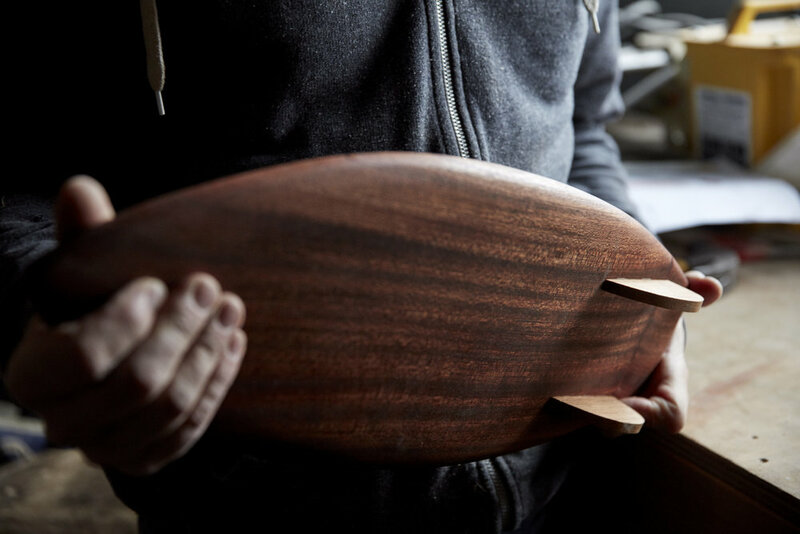 Everyone all said its hard to make wooden surfboards and impossible to fix them but you did just that. 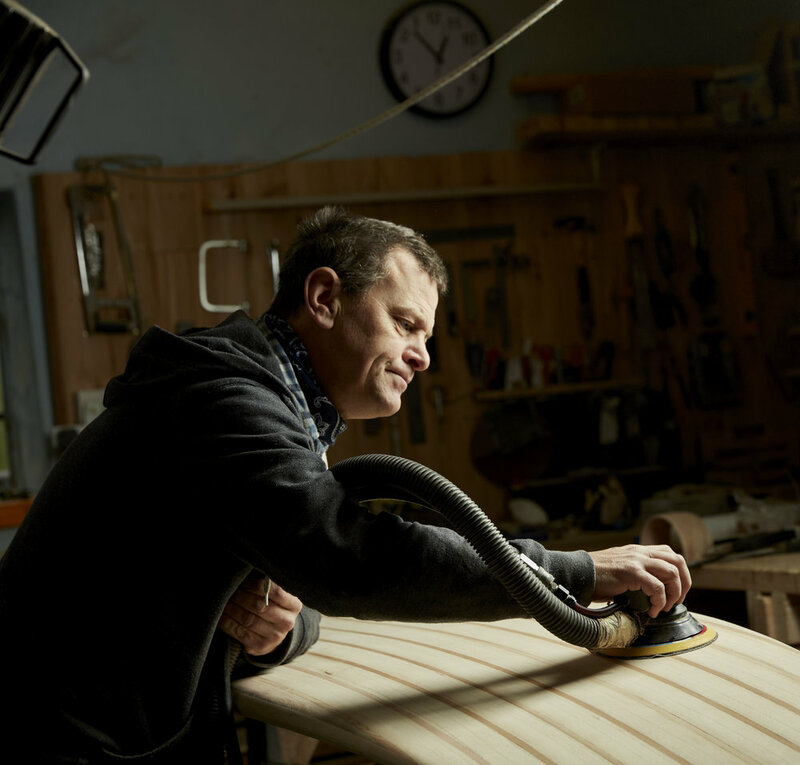 The craftsmanship of your repair is outstanding and you made it into a feature of the board." "Dear Chris, Thank you for doing such a brilliant job, bringing the board make to life again. Fantastic surf board, beautifully hand made.Great job Chris, thanks very much, highly recommended! 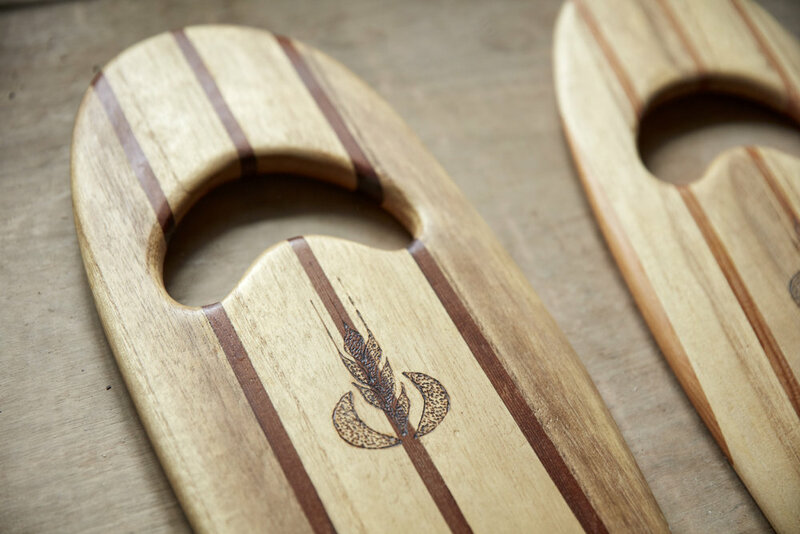 BTW I'm not sure if I told you but the hand boards you made before as a present for me went down amazingly well, the parents said it was the most thoughtful and lovely pressie they had received, which was lovely to hear! My sister absolutely loved the board! I think she’s posted it on Instagram and tagged you in her post. Happy holidays and thanks again for your effort and craftsmanship.